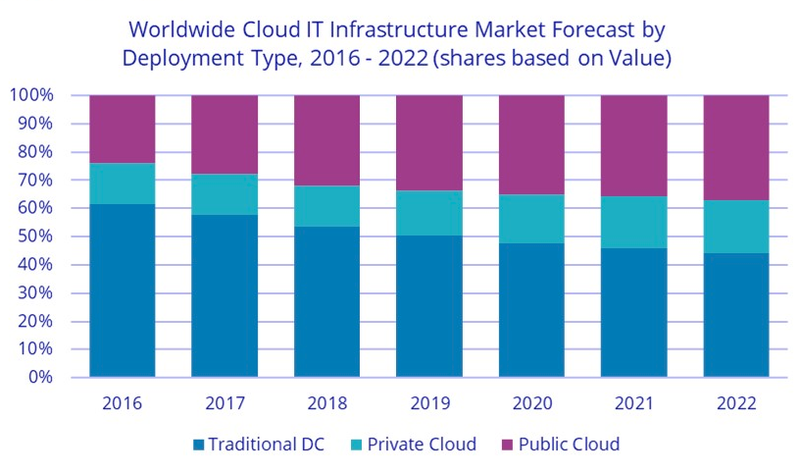 According to the latest worldwide market study by International Data Corporation (IDC), vendor revenue from sales of infrastructure products for cloud IT -- including public and private cloud -- grew 48.4 percent year-over-year in the second quarter of 2018 (2Q18), reaching $15.4 billion. IDC also raised its forecast for total spending (vendor recognized revenue plus channel revenue) on cloud IT infrastructure in 2018 to $62.2 billion with year-over-year growth of 31.1 percent. Quarterly spending on public cloud IT infrastructure has more than doubled in the past three years to $10.9 billion in 2Q18 -- growing 58.9 percent year-over-year. In 2Q18, spending on private cloud infrastructure reached $4.6 billion, an annual increase of 28.2 percent. IDC estimates that for the full year 2018, private cloud will represent 14.8 percent of total IT infrastructure spending -- growing 20.3 percent year-over-year. The combined public and private cloud revenues accounted for 48.5 percent of the total worldwide IT infrastructure spending in 2Q18 -- that's up from 43.5 percent a year ago and will account for 46.6 percent of the total worldwide IT infrastructure spending for the full year. According to the IDC assessment, investments in all three technologies will increase across all cloud computing deployment models -- public cloud, private cloud off-premises, and private cloud on-premises. By 2022, IDC expects that traditional non-cloud IT infrastructure will only represent 44 percent of total worldwide IT infrastructure spending -- that's down from 51.5 percent in 2018. This share loss and the growing share of cloud environments in overall spending on IT infrastructure is common across all regions. Public cloud data centers will account for 66 percent of this amount, growing at an 11.3 percent CAGR. Spending on private cloud infrastructure will grow at a CAGR of 12 percent.